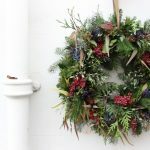 If you’d like to learn how to make a glorious natural Christmas door wreath using the most exquisite seasonal foliage, aromatic herbs and berries from our sustainable flower farms, then you’ve come to right place. 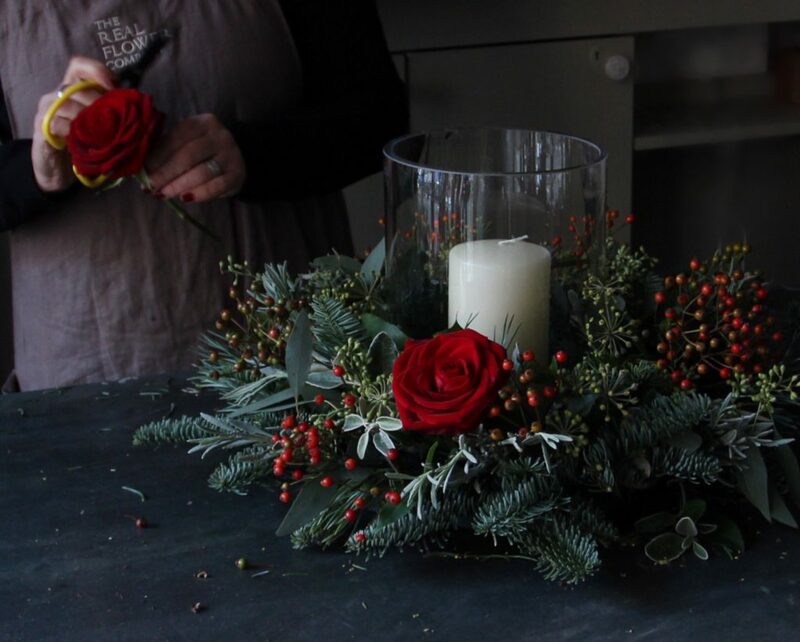 And if you are unable hang a wreath on your door, you can learn how to make a striking Christmas table centrepiece using the same techniques. Nothing welcomes your guests at the threshold or gives passers-by that warm Christmassy feeling as effectively as a festive door wreath. And when you attend one of our Christmas wreath-making workshops in London or Petersfield, Hampshire, you’ll receive a warm welcome too! Under the expert tuition of Catherine Rubaine in London or Becky Steed in Hampshire, you’ll be guided, step by step, through the art and craft of making your own show-stopping Christmas door wreath or a sensational centrepiece decoration to give your Christmas table a truly festive feel. You’ll be provided with a wide selection of spectacular seasonal foliage, scented herbs and berries to work with, including rosemary, silver lavender, berried ivy, pine, spruce, eucalyptus, viburnum and hebe. We’ll also have a cornucopia of festive extras such as pinecones, cinnamon sticks and citrus for you to use to add those personal finishing touches. 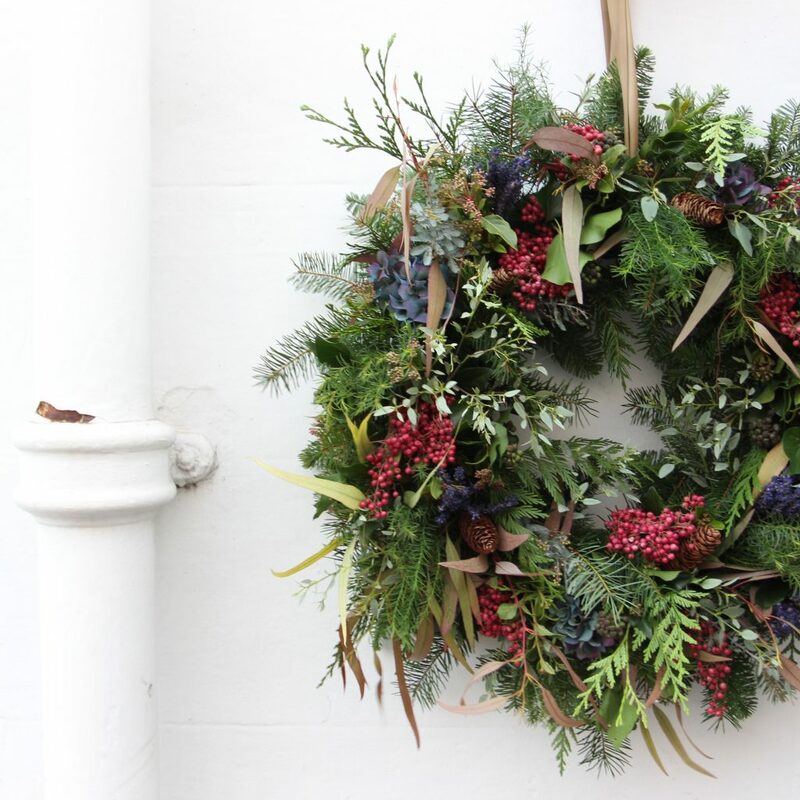 Whether you are complete beginner or an experienced florist, Catherine and Becky will work with you to make sure you gain all the know-how and insider tips and tricks to create a truly magnificent Christmas door wreath or decoration that’s unique to you. We’ll start with a cup of tea or seasonal tipple while Catherine or Becky gives a short demonstration. You’ll then be able to choose from our superior range of sustainably grown stems to create your masterpiece. If you join us in Petersfield, Hampshire, you’ll have the chance to see behind the scenes at The Real Flower Company’s florist workshop, where Becky and her team gather the best seasonal flowers and foliage from our sustainable farms to lovingly hand-tie bouquets and wreaths that you can order on our website for next-day UK delivery. If you join us in Sydney Street, London, you’ll be given an exclusive sneak peek at our Christmas collection, as we take over the Cabbages & Roses light-filled, picture-perfect studio. It’s a short walk from South Kensington, Sloane Square and King’s Road in the heart of Chelsea. You’ll be part of a small group of no more than ten and should feel equally at ease if you come alone or bring a companion to join in the festive fun. Catherine or Becky and our florists will be with you throughout to answer questions, guide you on technique and offer expert support whenever it’s needed. The sessions are relaxed and informal, and you’ll even be able to enjoy a generous slice of homemade cake! Over the last 10+ years we’ve built up a loyal customer following for our Christmas wreaths and have won a raft of awards for our floristry and flower farms. 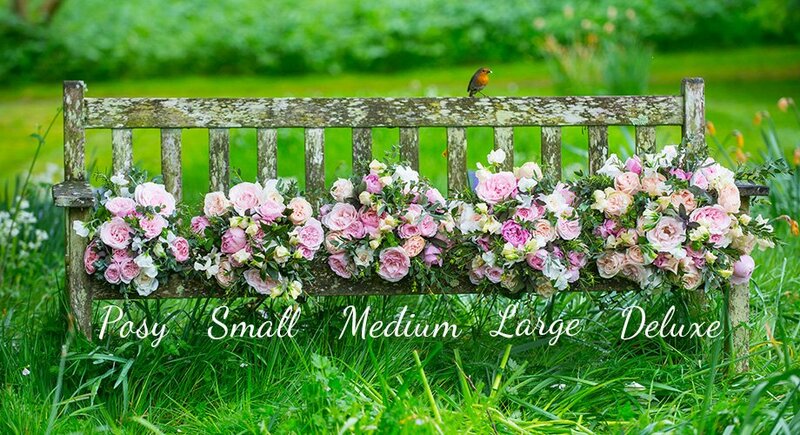 As well as creating bouquets and wreaths with the flowers and herbs we grow, we also supply some of the leading names in the trade and act as David Austin’s official cut-stem farmer and supplier. We believe that Christmas wreaths should be generous and should use the very best of sustainably grown seasonal herbs, berries and foliage. You can view our Christmas wreath collection here, including our romantic Woodland Wreath, Scandi-inspired monochrome and green Nordic Wreath and classic Herb & Berry Wreath. You’ll leave with your glorious Christmas wreath and the know-how to make your own Christmas wreaths for years to come. If you are joining us for the London workshop you’ll also receive a goodie bag that includes one of the Cabbages & Roses new scented candles (worth £30) as well as a glass flower tube from The Real Flower Company (worth £25) to make the perfect festive table centerpiece. Interested? You can book your ticket here for London and here for Petersfield.